The latest release on Genesis Music welcomes Monojoke to the label for a brand new EP. The Polish artist is making his debut on the Belarus based, Michael A owned imprint which follows a string of successful offerings on Electronic Tree, Superordinate and Welcome Music. 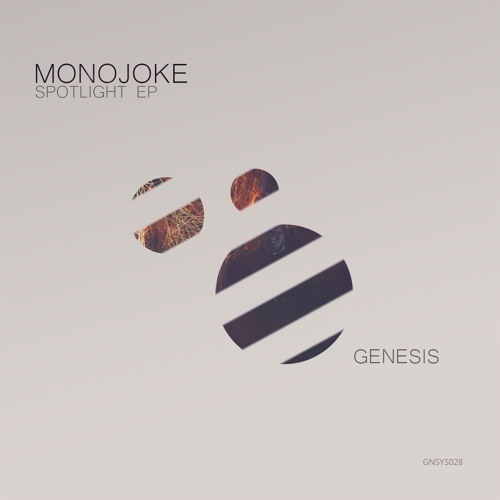 Now for his much anticipated Genesis Music debut Monojoke presents his two track ‘Spotlight EP’. Getting underway with the title track we find Monojoke sticking to his progressive roots and delivering another monster production. A healthy complement of drums locks down one hell of a wicked groove. Long menacing slabs of bass power forward as spiralling effects and sheets of white noise steal the air. It’s the ‘prog club’ sound of now essentially and Monojoke along with Dmitry Molosh and Subandrio are some of the best at it. Always looking for that moment of beauty Monojoke crafts a heartfelt break and when that bass line drops it’s lights out. Big tune from the Polish artist. The companion piece and aptly titled ‘Floating Thoughts’ comes in a touch deeper and more indistinct. Anchored by another wonderfully carved foundation the track proceeds to flow through a variety of vocal motifs and subtle melodic hooks. Like most Monojoke tracks the power of its groove is undeniable and a jangly lead synth complements it nicely. There’s a sense of ending with the track as well making it ideal for late night play and it certainly leaves you with a great feeling about the release as well. Gorgeous work from Monojoke and a great release for Michael A’s Genesis Music. Don’t miss it.